Well, we're nearing the end of the mod-a-day project and I'm entering that territory where I have to start giving out mod-a-day lifetime achievement awards. Scratch that. That makes it sound like the bands don't deserve it. Rather, they don't deserve it from me. I mean who the hell am I to tell you about The Kinks or any other great band, mod or otherwise. In the case of The Kinks it's not hard to make a case for them being a mod band. I mean, have you ever listened to the band? They eschewed the label in the early part of their career, but I wouldn't be terribly surprised that they would like to be seen in that light now. Everyone knows that The Kinks are somwhere in everyone's top ten list of greatest bands ever. I can't add much to that. 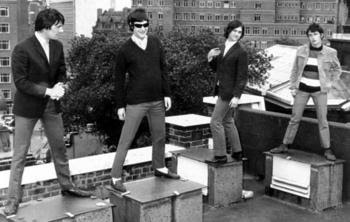 All I can do is let you know that they had some great mod tendencies both early and late in their career. The enjoyment of that career is all up to you. Here's a couple of good ones. The first, "Powerman" is from a rather obscure 1970 album, and the second is one of the band's all time greatest hits, and one of my all time favorite songs, "Waterloo Sunset".